The Bronte-Along is picking up some great momentum! Wow, people are totally doing this! Participants are starting to post their second and thirds posts on Jane Eyre! This brings me to a little bit of Bronte-Along business (I will add this to the main pages, too). To keep this from getting confusing (too late?) I propose that we each maintain our own archive of posts by book. My hope is that if someone stumbles on this project in a year, say, they can click a link in the Mr. Linky Widget for Jane Eyre and be taken to an archive of that blogger's posts about the story. Here, I will do my own so you can see. And while I'm at it, I will just make this a model to follow and include everything that should be included. Hey, better late than never right? This is what happens when you just make stuff up as you go along. But I don't mind, because if I had to plan this out, I never would have done it. So just bear with me, ok? Jane Eyre part of the Bronte-Along, like your own original post stating that you were joining us. *This is where I say what it's all about: The Bronte-Along is an online celebration of the Bronte Sisters, blah blah blah whatever you want to say about it, and you can read more about it here. *Next, if this were really my original post as a new participant, I would point to the main Bronte-Along page and state how this was the brainchild of Melissa Averinos from YummyGoods and Beth Dunn from An Accomplished Young Lady. I might say something awesome about those people. I might say that they have a new blog together called Eggplantia. *And now this is when I would say why I am joining in the fun. Like, how much I loved the movie and book and am obsessed and .... swoon, swoon, smoulder. I know, you already know this, (as if you could have missed it!) but I am pretending this is my first post. *If this were really my first entry about it, I would state how I plan to participate. You know, like by watching the Masterpiece Theatre 2006 Jane Eyre (um, pretty much every day) and reading the book constantly and scouring the internet for related media and content. And swooning. And insisting that everyone I know watch the film. Also? Swooning. Don't forget to mention our unique spin on the idea of a book club (aside from reading not actually being required, of course, which you must admit is pretty unique for a group about books): crafting/art-making etc inspired by or related to the story! 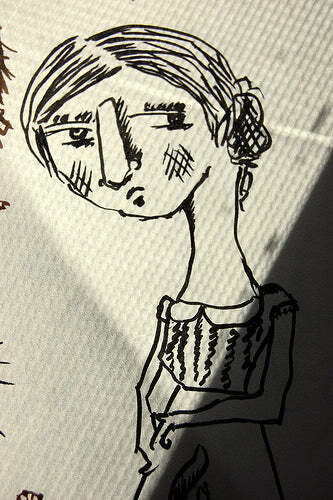 You know that I have been drawing and painting the characters. 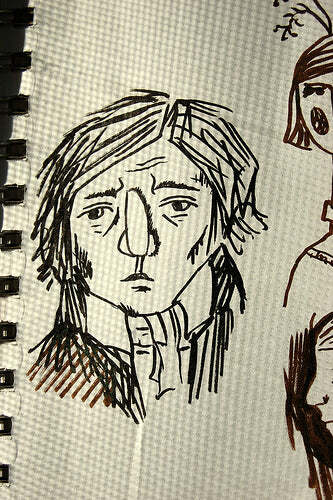 Next, I plan to do some embroidery and make some Jane and Rochester dolls! Woooo! 359: obsessed The beginning of the obsession: the post I wrote after watching the Masterpiece Theatre 2006 Jane Eyre. I had never read the book and I didn't know the story. How could this only have been a month ago? 360: More on the Moors Drawing and painting Jane and Rochester while watching the film twice in a row Like a crazy person. Jane Eyre My first guest post on indie design blog Scoutie Girl, where I featured awesome Jane-inspired goods. 362:omg, hornfield My silly illustration of an alternative Thornfield where Mr. Rochester is a unicorn. That's perfectly normal, right? 363: You are cordially invited Two weeks into the obsession and no end in sight, I came up with the idea of the Bronte-Along. I mean, I was pretty much trying to get everyone to join me anyways, right? Plus some more Jane paintings. 364: Bronte-Along! 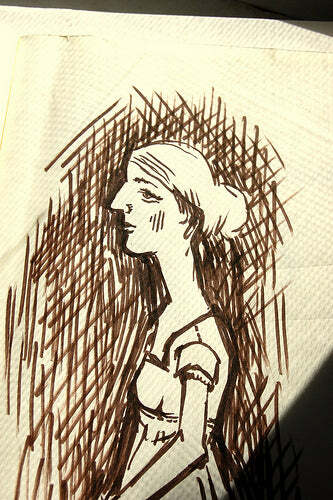 Jane Eyre! 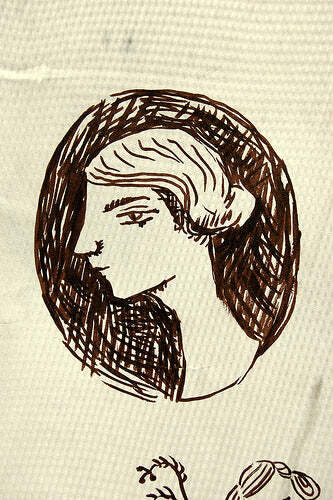 The main Jane Eyre page complete with new Bronte-Along logo goodness! This is where to go for links to everyone who is participating in Jane Eyre. 367: I'm come back! I returned from vacation with signs of Rochester in Key West. Yes, really. 368: melissa + beth=awesome In this post I reveal Eggplantia, my new blog with Beth Dunn. Eggplantia is the new home of the Bronte-Along, all future ---Alongs (including Austen, up next!) and our other awesome joint projects. 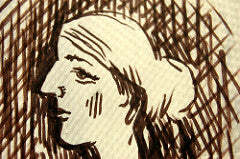 I will update this post with links to subsequent Jane Eyre-related posts that I write. See how that states what it is, why I am interested in the Bronte-Along, how I am going to participate in the group and who created it? And it lists all my posts related to Jane Eyre? Pretty good, right? Isn't it nice that you don't have to go searching to see if I wrote anything else about Jane Eyre besides this post? No need to add each link to Mr. Linky, just this one that archives all of them. Where are all my posts about it? If you have already done your first post and didn't cover all this, you can just edit your post if you feel like it. I promise, it's really not that complicated! And it's so much fun. You should totally join us. This post took me two hours to write. Where my coffee at? Also, how many times can I say post in one post? Many, many times, as it turns out. Dear friends, please do not despair. I won't always be posting about this stuff, ok? I am still doing all the stuff I usually do and will write about some non-Jane stuff in my next entry. I have some rust pics from Key West to show you and I am about to work on some fabric designs!